Prime Minister Theresa May is battling to assert her authority over a divided Conservative Party as she faces calls to quit as its leader before the next general election. 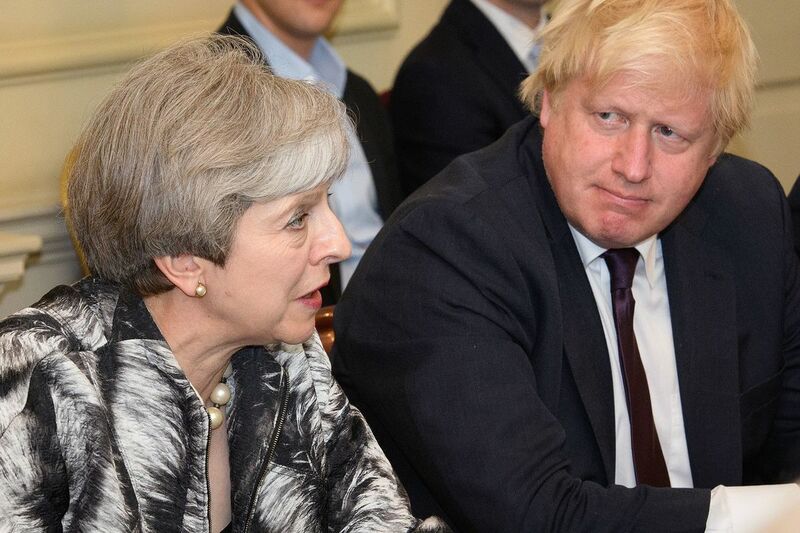 While May insists she will fight on, a former party chairman said she could not be allowed to stay until the next election in 2022, amid reports that Foreign Secretary Boris Johnson believes she will be gone within a year. In a BBC Television interview on Sunday, May ducked the question over whether Johnson is now impossible to fire after his latest outburst on Brexit, in which he set new demands for the negotiations with the European Union. She insisted Johnson and the rest of her cabinet are agreed on her Brexit policy, which she set out in a speech in Florence, Italy, on Sept.
“What I have is a cabinet that are united in the mission of this government,” May said on the BBC’s “Andrew Marr Show” before the start of the Conservatives’ annual conference in Manchester, northwest England. “Boris is absolutely behind the Florence speech and the line that we have taken. ” May is attending the first gathering of party members and lawmakers since her disastrous decision to call a snap election cost the Conservatives their majority in Parliament in June. The failure of her campaign severely undermined May’s authority over the party, but she insisted in an interview with The Sunday Telegraph newspaper that she will stay on as leader to fight the next election. The Sunday Times, however, reported that Johnson believes May will be ousted within 12 months. The foreign secretary is himself facing calls for his removal after making his own demands for Brexit policy public, in what was seen as another direct challenge to May’s leadership. ‘Red Lines’ The jockeying for May’s job has added uncertainty to negotiations for Britain’s break with the EU. Johnson fed into the confusion on Saturday when he warned in an interview with the Sun newspaper that he has four “red lines” for May. The transition should be two years and “not a second more,” he said. should stop accepting EU court decisions during the transition, must not accept any new rules, and must stop paying for access to the single market after the period ends, he said. May’s deputy, First Secretary of State Damian Green, said Sunday he hoped Johnson would put an end to any idea that he is trying to destabilize the prime minister. Leadership speculation “has to stop” for the sake of the country because it gets in the way of the Brexit negotiations, Green told ITV’s “Peston on Sunday” show. In her BBC interview, the premier was asked if Johnson had now become “unsackable. ” She laughed and said: “You talk about Boris’s job, you talk about my job; I think the people watching this program are actually interested in what we’re going to do for their job and their futures and their children’s futures. ’’ Florence Speech May also refused to say whether the U.
will have to accept changes to EU law during the Brexit transition period, despite no longer being able to shape those laws as a member of the bloc. Johnson had said such an outcome would be unacceptable. On Brexit, the prime minister said EU leaders had welcomed her Florence speech. While the government is preparing the ground for leaving the EU without a deal, she hopes and expects to be able to reach a good settlement in Brussels, she said. Grant Shapps, who was chairman of the Tory party under David Cameron, said May should stay on as leader until Brexit was completed in 2019 but should then be replaced, telling Peston on Sunday she “can’t go on until 2022. ” However, Immigration Minister Brandon Lewis said May could continue that long. “Five years from now, we can have delivered a good Brexit,” he told BBC TV’s “Sunday Politics” program. “A prime minister in that position absolutely is right to run on their record. ” An official party review of the June election fiasco warned that the Tories must be ready to fight the next contest at any moment. Eric Pickles, the former minister who led the review, said this was especially important given the instability of a hung Parliament. Jeremy Corbyn’s main opposition Labour Party has already begun preparing for the next vote. Jon Lansman, founder of the pro-Corbyn grassroots Momentum movement, said activists are already targeting Conservative lawmakers in vulnerable seats. “They need to prepare because we’re in their constituencies now,’’ he told the BBC. “We’re mobilizing thousands of people every weekend to go to Tory marginals and unseat Tory MPs.